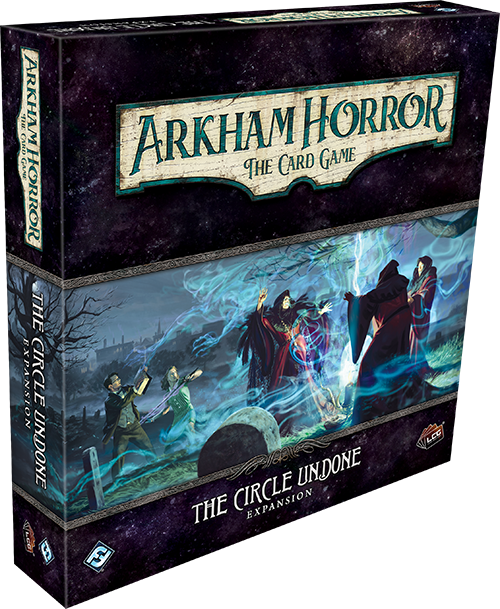 In The Circle Undone, a new team of investigators must unite to confront the terrors of Arkham’s macabre past as Arkham Horror: The Card Game moves into its fourth cycle. When four people disappear from an estate in French Hill, you begin your search for answers—but when the evidence points to witches and figures hidden in the mists, you must begin to question your own sanity. All you can be certain of is that Arkham’s oldest and most prestigious league, the Order of the Silver Twilight, is somehow connected. Moving against this powerful organization is a dangerous task, but there are those who have a history with the Order and will do whatever it tasks to expose their true nature. 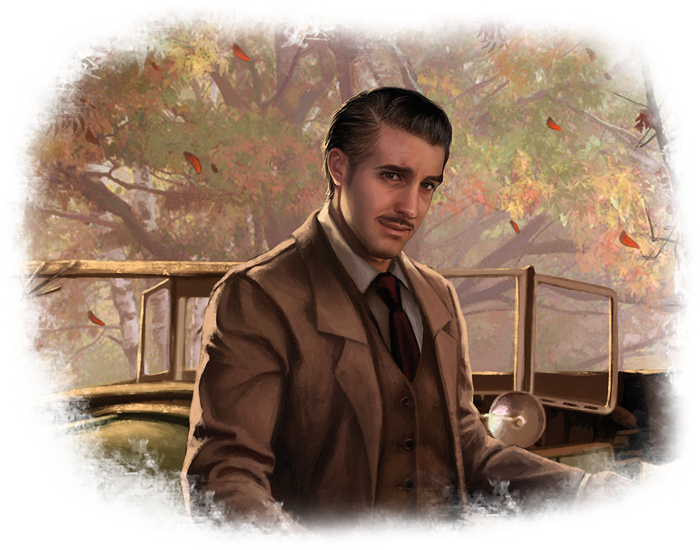 Today, we're proud to introduce you to Joe Diamond and Preston Fairmont, two of the new investigators you can add to your team in The Circle Undone—now available for pre-order at your local retailer or online through our website! Joe Diamond is a private investigator with a reputation for taking on the cases that everyone else dismisses as supernatural nonsense. He is thorough in his investigations and not one to trifled with. His services have been employed by the wealthy as well as those down on their luck—no case is too large, too small, too strange, or too dangerous. In Joe’s experience, things start getting nasty the closer you get to reaching the truth, and thats exactly where he likes to be. 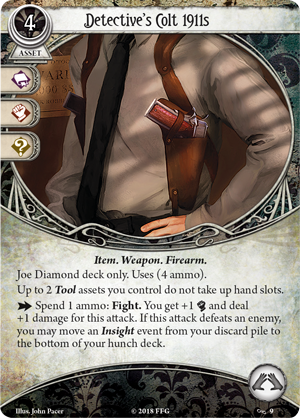 Joe Diamond (The Circle Undone, 2) is no normal investigator, and he immediately sets himself apart with a deck size of 40 cards. 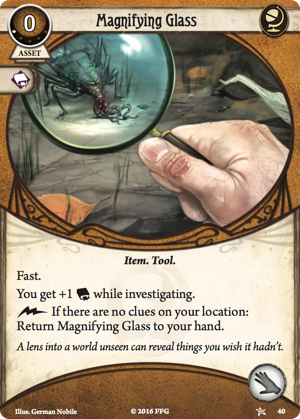 In addition to the detective’s standard deckbuilding requirements, the private investigator’s deck must also include at least eleven Insight events. 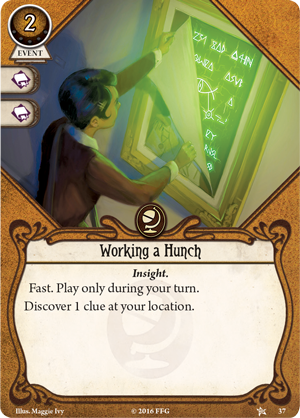 At the start of each game, ten of these cards and Joe’s signature weakness are shuffled to form his separate “hunch deck.” Then, at the start of the investigation phase, Joe reveals the top card of his hunch deck! 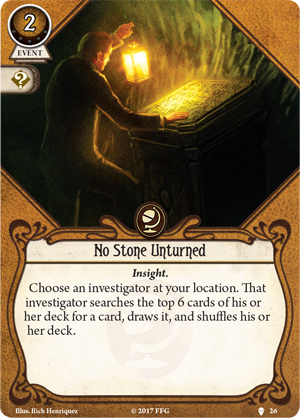 For the rest of the phase, he has the option to play this card for two fewer resources, using pivotal events like No Stone Unturned (The Path to Carcosa, 26) or Working a Hunch (Core Set, 37) for free! Even if he reveals a card that won't serve the needs of the current round, he won't lose the chance to play it. At the end of the round, an unused hunch card is simply shuffled back into the hunch deck. But Joe’s obsession with his work comes with its own risks and the hunch deck must include his signature weakness, Unsolved Case (The Circle Undone, 10). 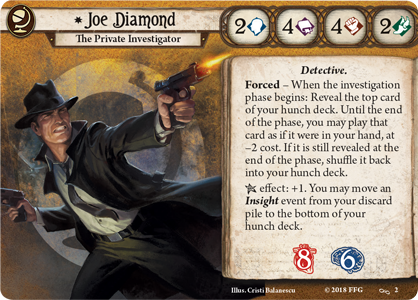 When this event is revealed, Joe must pay two resources and place one of his clues on the location with the highest shroud to remove Unsolved Case from the game. But he only has a single turn to accomplish this task. 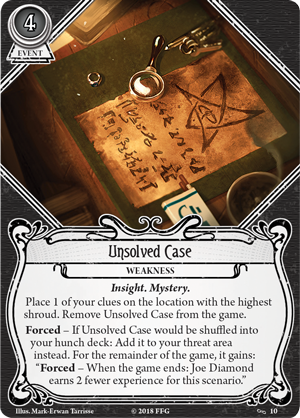 If he should choose not to meet this requirement, however, he's forever haunted by his failure: Unsolved Case is added to his threat area and at the end of the game he gains less experience than his fellow investigators, regardless of how many secrets he uncovers. When one cannot let go of the past, it is impossible to move forward. Joe Diamond was never one for stealth. He tends to make an impression… or, at least, his Detective's Colt 1911s (The Circle Undone, 9) do. While these Weapons do fill both hand slots, the shoulder holsters keep the PI’s hands free for up to two Tool assets, ensuring that he can always keep a Magnifying Glass (Core Set, 30) on hand or a trusty Fingerprint Kit (The Circle Undone, 24). Beyond their convenience to carry, these firearms are deadly in a fight. As an action, Joe may spend one ammo to fight with the Colt 1911s, raising his combat skill and dealing more damage. Then, if the blast manages to defeat his enemy, Joe can move any Insight event from his discard pile to his hunch deck, even if it was not originally a part of the deck at the start of the game. Like Joe, these weapons may not be subtle, but they get the job done. 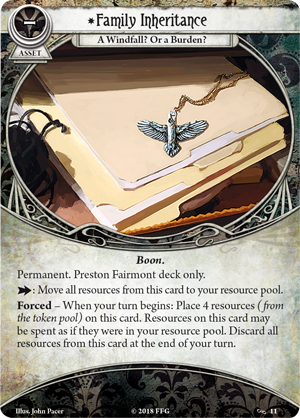 Preston Fairmont (The Circle Undone, 3) can dip into his Family Inheritance (The Circle Undone, 11) at any time during his turn, spending resources from the card as if they were in his resource pool. These resouces even refresh at the start of his next turn, so he'll never be caught without funds. But this wealth comes with a cost. 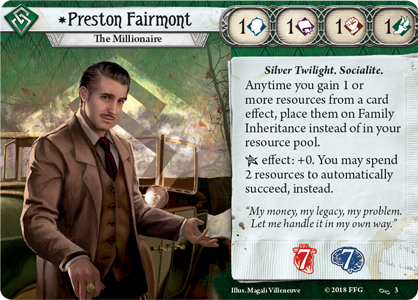 Since his return to Arkham, Preston can feel the eyes of the Silver Twilight Lodge following him and his family’s business, tracking each deal he makes and nearly all his income. Any time when Preston would gain resources from a card effect, they must be added to Family Inheritance instead of his resource pool. 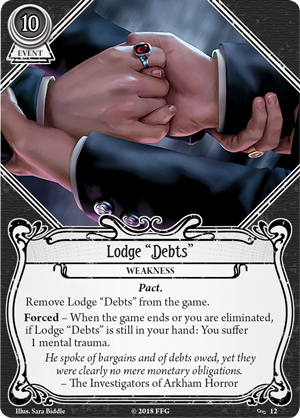 He can use an action to transfer all the funds from the card to his pool, but if he cannot do so before the end of his turn, the Lodge will step in and all of these resources will be lost. While his windfall places Preston in a privileged position, he must ask himself whether this legacy is a blessing or a curse. When he was alive, Preston’s father spoke of Lodge "Debts" (The Circle Undone, 12), which have now passed to the young man. This Pact costs a staggering ten resources to be played and removed from the game, and if Preston cannot accomplish this before the game ends, he suffers one mental trauma. Preston may not have been close to his father, but he would never sully his legacy by ending up on the wrong side of the law. As such, he also cannot have any Illicit cards in his deck. He can, however, include Survivor cards up to level two, granting him VIP access to a plethora of skill cards that he can commit to tests. 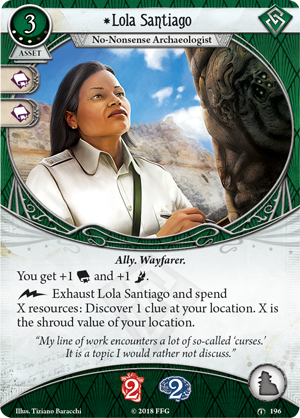 While Preston’s base skills are set at one, he can use his immense wealth to easily purchase talents like Streetwise (Blood on the Altar, 189) to boost his skills at a moment’s notice, or hire the aid of Allies like Lola Santiago (Heart of the Elders, 196) and Dario El- Amin (The Unspeakable Oath, 151). 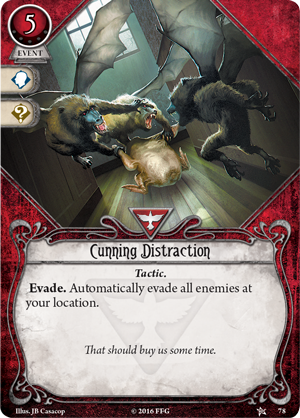 Of course, skill tests can be so tedious, and Preston may choose to bypass them altogether with expensive cards like Cunning Distraction (Core Set, 78). 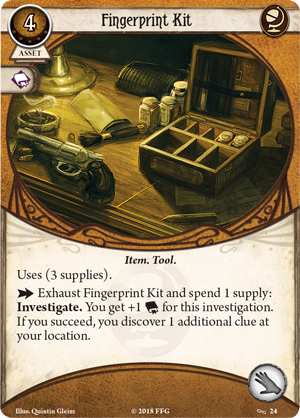 While other investigators may only use these high-cost cards in dire circumstances, for Preston they are everyday luxuries. 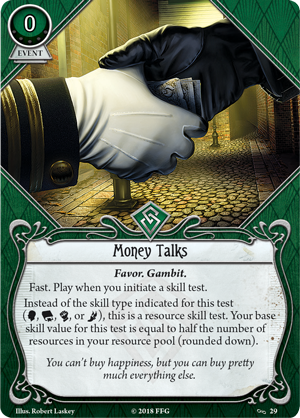 More than anything else, Preston Fairmont knows that Money Talks (The Circle Undone, 29). This Favor changes a skill test into a resource test. Rather than testing a skill type, Preston’s base skill is set equal to half of the resources in his pool. As a millionaire, Preston may not be able to buy happiness, but he can buy pretty much anything else. 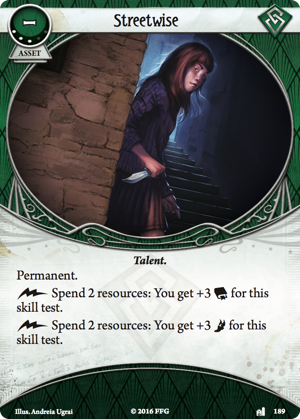 You may not know how the Order of the Silver Twilight is related to the strange events haunting Arkham, whether they are on the side of good or evil, but if there is a secret to be uncovered, you can be sure that Arkham’s investigators will get to the bottom of it. 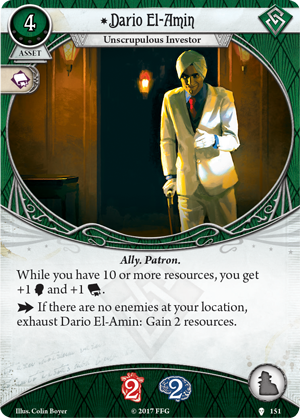 With Joe Diamond and Preston Fairmont on your side, the nature of the Order will soon be revealed, but will the truth you bring to light prove more deadly than the things that lurk in the dark? Pre-order your copy of The Circle Undone (AHC29) at your local retailer today or online through our website here!